This is my favorite brand of popcorn. Yummy stuff. These are oil-based so they are suitable for coloring white baking chips. Most of the common food colorings found in grocery stores are water based and will make the melted chocolate immediately form a paste consistency that can't be drizzled. Includes pink, green, violet, and black. 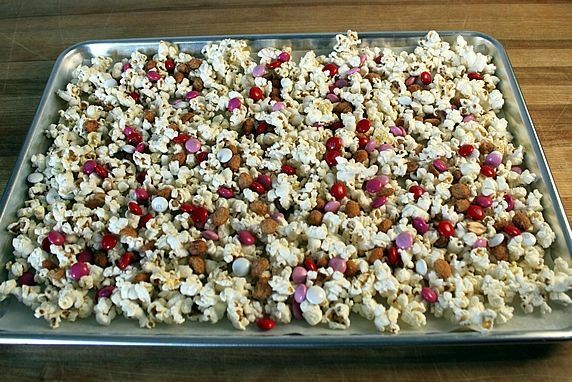 I use the larger 13x18 baking sheet in this set for making my popcorn party mixes. It's so convenient to be able to cover and store it until serving time. 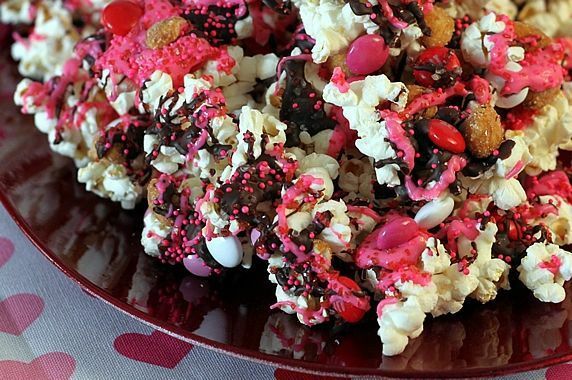 These add a crunchy, decorative touch to the popcorn mix. 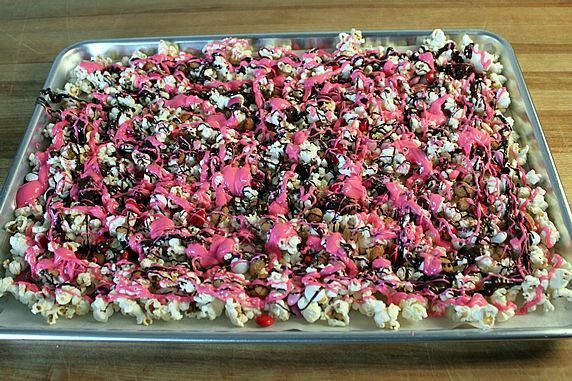 Click below for more red & pink sprinkle options. I use these for making pretty party bags. 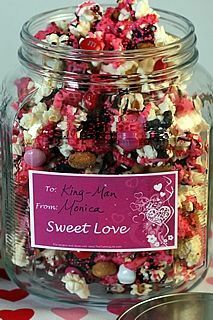 This mix makes a great party favor or classroom treat. These are salty, sweet, crunchy....and peanutty! 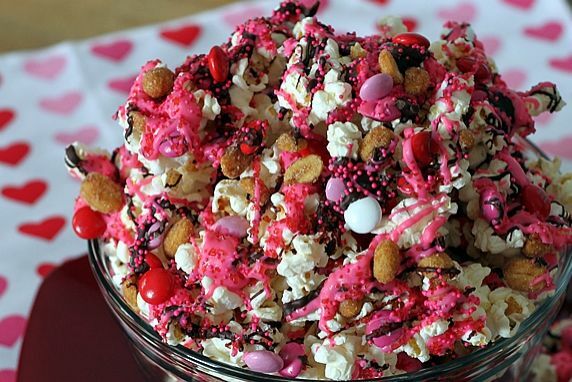 This easy mix is festive, delicious and pretty for Valentine's Day or any "pink" party--wedding, baby girl, princess birthdays, etc. (The colors can be changed for any occasion.) It's great for classroom party treats or to take to the office to share with co-workers. 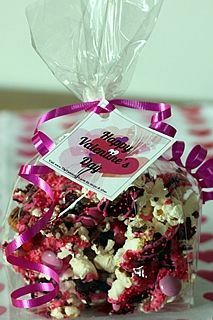 Put it in bags or jars for party favors or gifts. 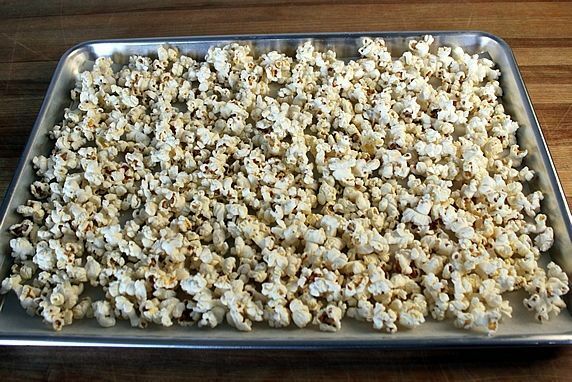 Spread popcorn on a large baking sheet that has been lined with parchment or waxed paper. Sprinkle peanuts and M&Ms evenly over top. Combine chocolate chips with 1/2 tablespoon oil and melt in microwave (see melting instructions at www.TheYummyLife.com/recipes/26). 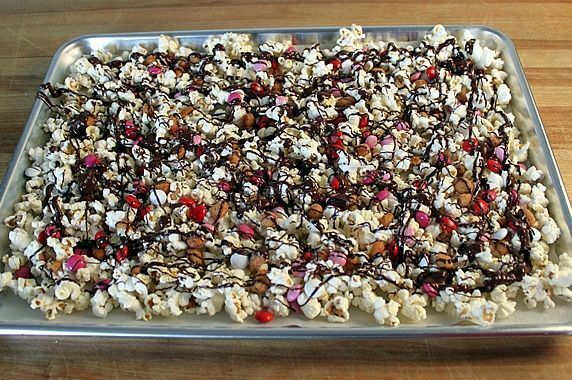 With spoon, drizzle evenly over popcorn mixture. Sprinkle with coarse sea salt. 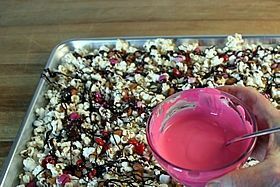 Add food coloring and 1/2 tablespoon oil to white chips, melt, and drizzle over popcorn mixture. 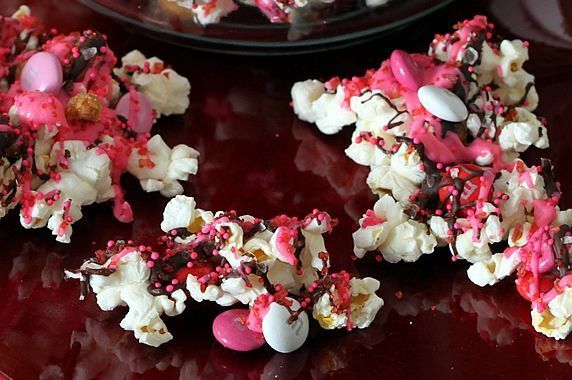 Sprinkle with decorating red sugar and pink nonpareils. After melted drizzles harden, break into pieces and store in airtight container or sealed plastic bags. *Modify food coloring and M&M colors for any occasion: colors of sports teams or schools, green for St. Patrick's Day, red/blue for 4th of July, black/orange for Halloween, red/green for Christmas, etc. Food coloring can be omitted entirely--use plain white melted chocolate and rely on M&Ms and sprinkles to add color to the mix. **White chips are best to melt if you want to color them; other chip flavors can be used as long as their colors work with the occasion. 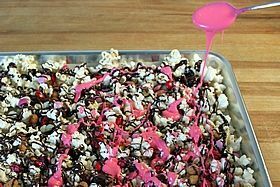 Awhile back I made a Game Day Popcorn Party Mix in team colors for a Super Bowl party. 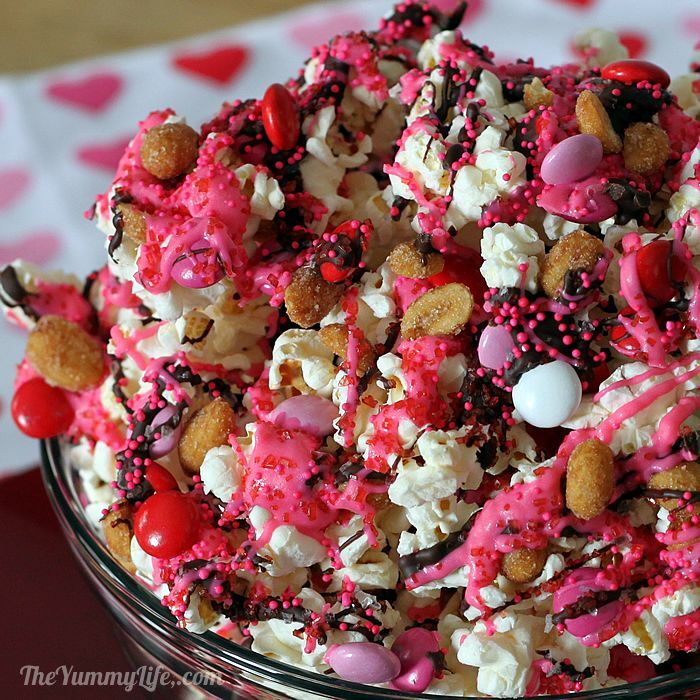 Today's post is about a similar party mix, with a few additions to make it festive and pretty for Valentine's Day or any "pink" party--wedding, baby girl, princess birthdays, etc. (The colors can be changed for other occasions.) This mix is delicious, easy, and the colors contribute to your party decorations. It's great for classroom party treats or to take to the office to share with co-workers. Serve it in a bowl, or put it in gift bags. This makes a fun gift or party treat or favor. Step 1. Assemble the ingredients: popcorn (I used oil- and salt-free air-popped); white chips for melting (vanilla or white chocolate); semi-sweet chocolate chips for melting (not pictured); honey roasted peanuts, M&M's in red and pink (this Valentine's Day version is widely available in stores in February); coarse sea salt; decorating sprinkles (I used pink nonpareils and red coarse sugar); neutral tasting oil (vegetable or grapeseed), food coloring (oil-based recommended; I used Wilton candy colors.). In place of the white chips you can use pink Wilton candy melts that are already colored; although the colors aren't as vibrant. You can also omit the food coloring entirely--use plain white melted chips and rely on M&Ms and sprinkles to add color to the mix. NOTE about food coloring. If you want to color melted baking chips or candy and maintain a thinner drizzling consistency, you need to use an oil based food coloring. This isn't commonly found in grocery stores. The more common water based food coloring will cause the melted chips to seize and thicken to a paste. It can be used, but you have to assemble the mix differently. 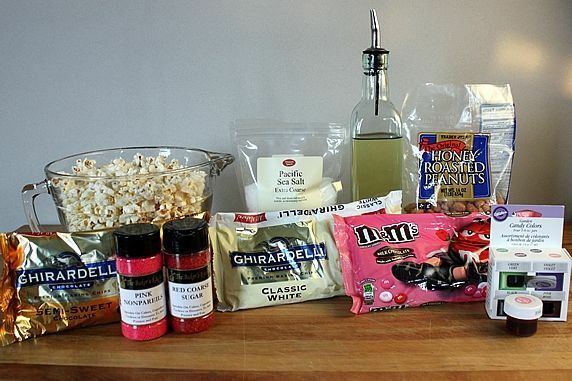 See my Game Day Popcorn Party Mix post for an explanation. Step 3. Sprinkle evenly with 1/2 cup honey roasted peanuts and 1/2 cup M&Ms. Step 4. 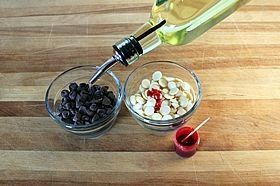 Add oil to chocolate and white chips. (Adding a small amount of oil, gives the melted chocolate a smoother, glazy texture and appearance.) Add food coloring to the white chips, if desired. Step 6. 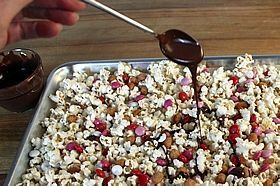 Use a spoon to drizzle melted chocolate on top of popcorn mix. Step 7. While the chocolate is still "wet", sprinkle it with coarse sea salt so the salt will stick. This makes a yummy sweet & salty taste combo. Step 8. 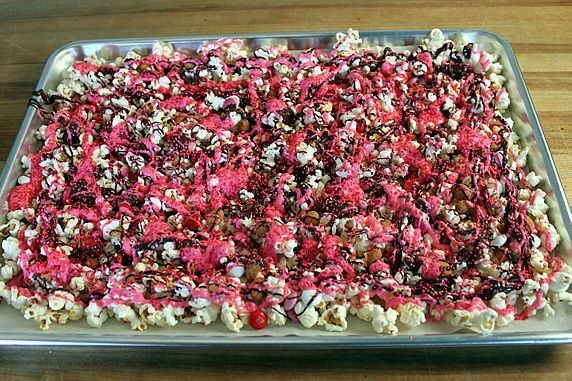 Next melt the pink-colored white chips; and drizzle the pretty melted mixture over the popcorn. Step 9. 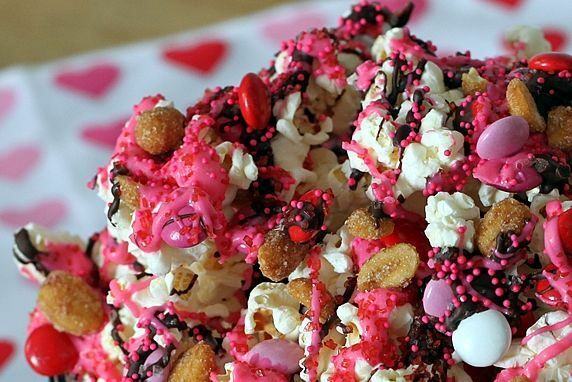 Before the pink drizzle hardens, sprinkle it with red sugar and pink nonpareils. 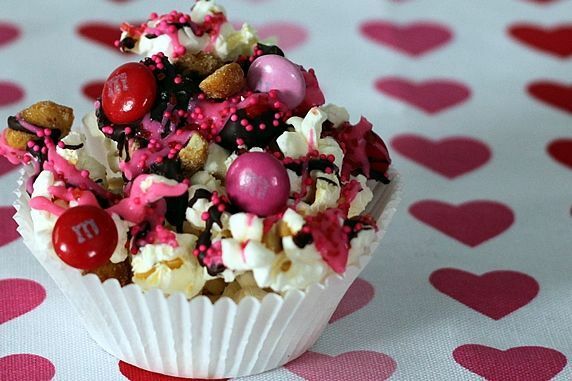 The sprinkles make the mix prettier, and also add some crunch. Step 10. Let the mix harden completely and break it into pieces. 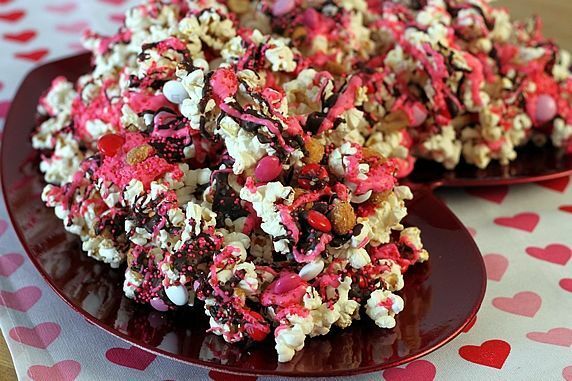 The hardened melted chocolate serves as glue to hold the candies, nuts, and popcorn together.